If you ever wanted to give your time to a cause guaranteed to make an impact, this is it! 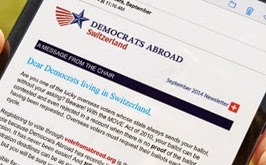 Sign up now to help Democrats Abroad Switzerland register voters and help Americans request their absentee ballots for the 2016 election. We are stepping up our Get-Out-the-Vote drive for the upcoming election so we want to have lots of VFA tables at venues and events all across Switzerland. Help Americans request absentee ballots for the 2016 Election ! Democrats Abroad is dedicated to guaranteeing that overseas American citizens can exercise their right to vote in U.S. elections, and reminding Americans Abroad to request and mail their absentee ballot each election cycle. We will give you the information, tools, and support you will need to help Americans living in Switzerland vote.